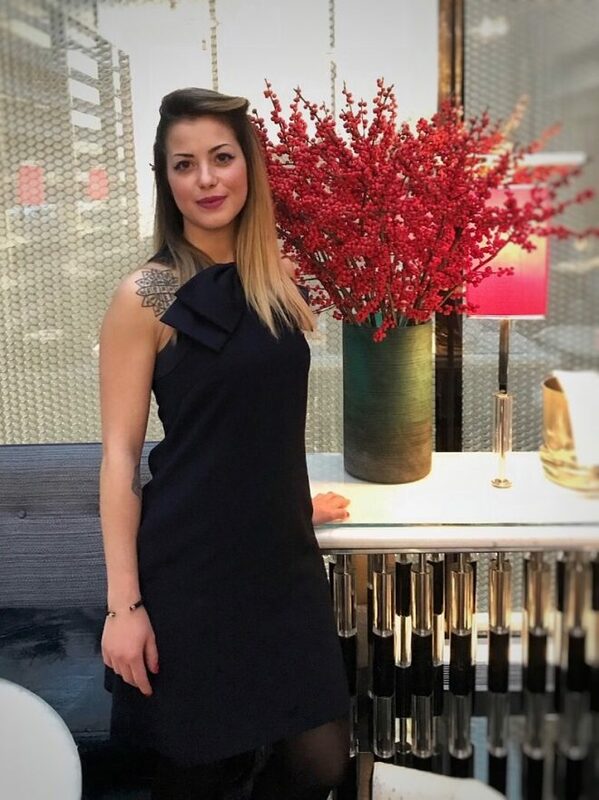 My name is Paola Idda and I arrived in London five years ago to work as a waitress in the Blue Bar at the Berkeley. About a year ago I became more interested in cocktails, maybe because of my studies in chemistry. I’ve come to understand that they have a lot in common, thanks to working here. When you are doing an infusion or a fat wash or a blend of vermouth, I understand how and why it works and it helps me a lot. My palate has also evolved to enjoy more bitter cocktails and the negroni is my favourite, because I am from Italy and it reminds me of a classic aperitivo. As a former waitress, I love to interact with guests and in my opinion a good experience is not only related to the cocktail, but the service, which includes the bartenders and the people on the floor. I am in charge of the concept Out of the Blue Bar which opened in November last year. It’s a bespoke machine in a room which allows you to experience new flavours you can share. We had the feeling that a drink doesn’t taste the same if you are in a different environment. For instance if you drink a mojito in Cuba on the beach under the sun, and you drink the exact same drink in a bar in London, it will taste different: it’s all about the place and the atmosphere. So we created this experience which is divided in 4 chapters, and for each chapter you have a drink with different smells and sounds around you. It’s a kind of 360° experience. It’s difficult to explain because it’s something you need to feel, like a blind tasting, so you all must come and experience it. I love it here because I still make cocktails, but at the same time I am a host who explains the concept of our idea which is exciting and challenging. My dream bar would be a fun bar on a beach in Spain, with Dj’s playing techno minimal music during the day and hard techno during the night with an interior with a futurist design to create a psychedelic atmosphere. Beside the bar, I would have a studio to offering tattoos and haircuts. The cocktails would be a mix of tropical flavours, classic cocktails and aperitivo with cheese and meat boards or fruit salad for the healthier people. On my free time I go to bars to meet bartender friends, as we are a real community. I love to go to the Beaufort Bar in the Savoy or Oriole, it’s also a very nice place. Otherwise I go shopping to keep me busy. I love whisky. You can have sweet, smoky or something savoury and bitter. It’s more difficult to find the balance with whisky, but when you do, it’s a more complex flavour profile. I also love to blend whisky with different liqueurs or other spririts like rum and cognac. My favourite whiskies are the peaty scotch whiskies or Japanese ones, like Hibiki 17… I especially love that one. For me a good cocktail needs to be balanced, presented well (this includes the garnish and the glass) and of course the service must be great, because it makes up around 80% of what you feel about a drink. I love ginger because it makes a drink spicy without killing your tastebuds like chilli tends to. In Rome you should go to Jerry Thomas and the Beaufort in the Savoy, in London.